Product prices and availability are accurate as of 2019-04-20 12:16:08 UTC and are subject to change. Any price and availability information displayed on http://www.amazon.com/ at the time of purchase will apply to the purchase of this product. Finally! A 21st Century way to touch up paint at any time. My Paint Saint keeps the paint in your home or business looking fantastic year round. It saves time and money. What sets MPS apart is that you never have to clean the brush. This saves time (obviously!) and also saves money because now you dont't need to keep buying new brushes because old ones were not cleaned properly. The paint sealed in the container does not oxidize, congeal or change color. This means you can touch up for years using the same paint and paint brush. - The unit itself consists of a synthetic bristle brush, a container which holds up to 13 oz. of paint, and a closing ring. - The brush head has a stainless steel ferrule attached to a disc. There is a silicone gasket on the underside of the disc that makes an airtight seal. Oxygen, which causes paint to both separate and dry out, cannot enter the container. - There are two shelves within the container to remove excess paint from the bristles. The bottom of the MPS jar allows you to store the closing ring which protects it from being lost or damaged while painting. 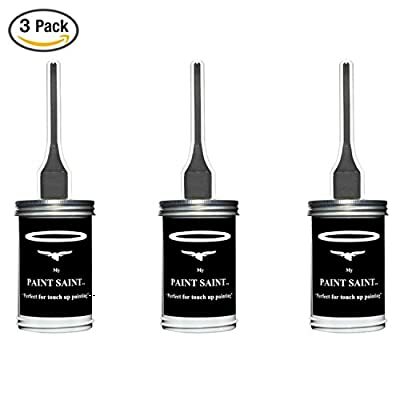 - The overarching concept of My Paint Saint is to seal the brush inside the container with the bristles submerged in paint and ready for use at any time. - My Paint Saint is priced affordably which allows you to purchase multiple units for multiple colors without breaking the bank! My Paint Saint is so easy and convenient to use you will touch up more often. This means your home or business will look its best at all times. Almost everywhere people live and work there is paint on the walls. My Paint Saint is perfect for homeowners, businesses, hotels, motels, stores, churches, schools, anywhere there is paint. Save time, save money and have your home or business looking its best--give My Paint Saint a try! TOUCH UP INTERIOR OR EXTERIOR PAINT IN MINUTES: Touching up your home or business has never been easier! Unscrew the top, and you're ready to get to work. When you're done, put the paint brush back in the can and screw on the closing ring to seal the paint inside. With touch-ups this easy, the paint in your home or business will look fantastic year round! NEVER WASH YOUR PAINT BRUSH: We used the 21st century way to seal liquid in a container and keep air out, using a silicone gasket. The gasket is pressed against the lid using a metal closing ring, which creates a hermetic seal. This air-tight seal prevents oxygen from entering the container so your paint will not separate or dry out. It also locks the bristles in a moist atmosphere and prevents them from drying out. This fantastic seal cannot be replicated by re-hammering a metal lid! QUICK, EFFICIENT AND NO MESS: My Paint Saint has two sets of threads for the closing ring. The top threads are used to create an air-tight seal, and the bottom threads provide a nifty place to store the closing ring while painting. This prevents it from being lost or damaged. A max fill line is on both sides of the container to aid the user. HIGH QUALITY PAINT BRUSH: The high quality 1½" x 5" synthetic bristles are thick and long enabling them to hold a lot of paint. The Paint Saint's ferrule is made out of stainless steel to prevent rusting. GET ONE FOR EACH COLOR IN YOUR HOUSE: At such an affordable price, you can get one for each color of your home or business.